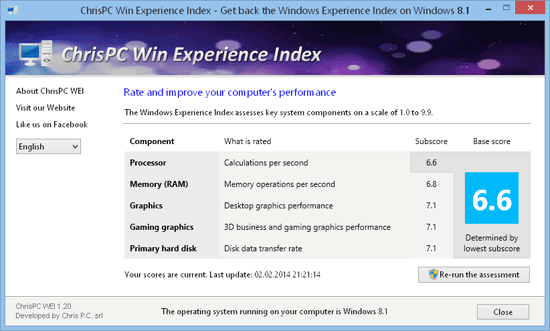 Rate your computer and gain access to Windows Experience Index score on Windows 8.1 and Windows 10. Get back Windows Experience Index on your Windows 8.1 and Windows 10 ! You want to have the latest Windows version 10 and also to be able to check your Windows Experience Index ? 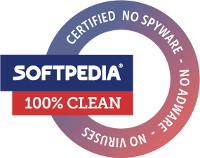 ChrisPC Win Experience Index was tested successfully on Windows 10 Version 1903, Windows 10 Version 1809, Windows 10 Version 1803, Windows 10 Version 1709 Build 16299.248, Windows 10 Build 10586.318 and Windows 10 Pro Version 1511. On some computer configuration the Windows System Assessment Tool - WinSAT might fail to calculate the WEI score so no ratings will be shown by ChrisPC WEI. In this case click on "More details" button and see where the assessment fails. Brings back the Windows Experience Index to Windows 10. Multi language interface: English, German, French, Italian, Portuguese, Spanish, Finnish, Romanian, Polish, Russian. How to check WEI ? All mentioned trademarks Windows, Windows Vista, Windows 7, Windows 8, Windows 8.1 and Windows 10 are trademarks of Microsoft Corporation.